Dry Scalp Natural Shampoo + Conditioner Bundle by Barefoot SOS, save money when you buy your Shampoo and Conditioner in a bundle. 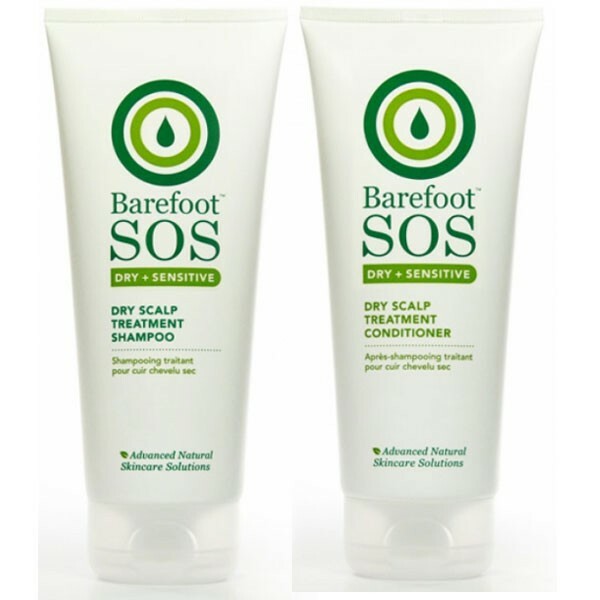 Barefoot SOS Dry Scalp Shampoo - Serious assistance for sensitive scalps. This mild therapeutic shampoo combines foaming coconut with moisturising jojoba and evening primrose oil to soothe dry, irritated scalps. Potent coltsfoot, horsetail, liquorice and yarrow promote glossy hair, while fragrant herbal extracts of lemon tea tree, French lavender, rosemary and geranium provide a stimulating aroma. 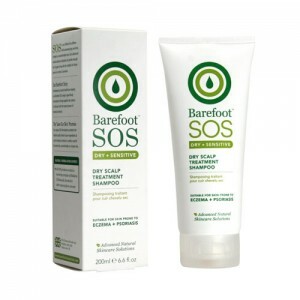 Barefoot SOS Dry Conditioner - Moisturising MSM, rice extract and essential vitamins combine with potent liquorice, coltsfoot and willow to promote glossy hair and soothe dry, irritated scalps, while fragrant herbal extracts of rosemary, lemon tea tree, geranium, and Himalayan cedarwood provide an invigorating aroma. Suitable for Vegans. Suitable for those prone to Eczema & Psoriasis. Enriched with moisturising jojoba and evening primrose oil to soothe dry, irritated scalps plus potent coltsfoot, horsetail, liquorice and yarrow. Essential Oils: Lavender, Lemon Tea Tree, Tea Tree, Geranium, Rosemary. Aqua, Sodium Cocoamphoacetate (Coconut surfactant), Glycerin (vegetable moisturiser), Lauryl Glucoside (Coconut surfactant), Maris Sal, Sodium Cocoyl Glutamate (vegetable surfactant), Sodium Lauryl Glucose Carboxylate (vegetable surfactant), Panthenol (vitamin B5), Alcohol (from Sugar Cane), Lonicera Caprifolium (Honeysuckle), Glyceryl Caprylate (Palm/Coconut emollient), Aloe Barbadensis (Aloe Vera), Leptospermum Petersoni (Lemon Tea Tree), Melaleuca Alternifolia (Tea Tree), Lonicera Japonica (Honeysuckle), Rosmarinus Officinalis (Rosemary), Lavandula Angustifolia (Lavender), Linalool*, Citronellol*, Pelargonium Capitatum (Geranium), Achillea Millefolium (Yarrow), Anthemis Nobilis (Chamomile), Arctium Lappa (Burdock), Ascorbyl Palmitate (vitamin C), Berberis Aquifolium (Mahonia), Calendula Officinalis, Equisetum Arvense (Horsetail), Glycyrrhiza Glabra (Licorice), Retinyl Palmitate (vitamin A), Salix Alba (Willow), Simmondsia Chinensis (Jojoba), Tabebuia (Pau dArco), Tussilago Farfara (Coltsfoot), Urtica Dioica (Nettle), Limonene*, Tocopherol (vitamin E), Geraniol*, Helianthus Annuus (Sunflower), Citral*, Citric Acid (from Citrus fruits) *Aromatic components of essential oils Certified Organic ingredients used wherever possible. 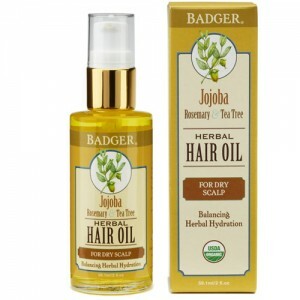 Massage into hair and scalp with fingertips to cleanse and soothe. Rinse and repeat everyday, or as often as you wish to wash your hair. Follow with the matching conditioner.